Established in 1973 and situated at 700ft. 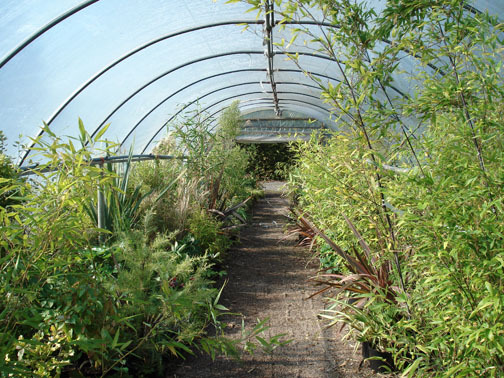 above sea level, close to the Peak District, the nursery specialises in the production of a wide range of hardy bamboos. 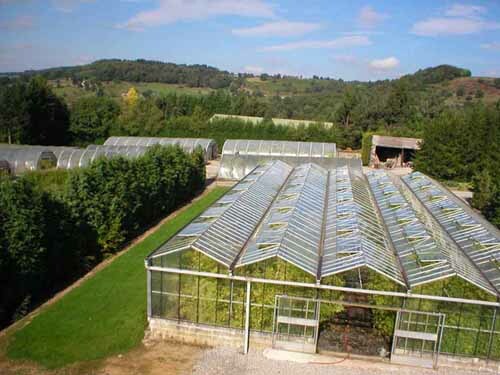 At present over 150 species and varieties are being propagated, many available in large sizes. 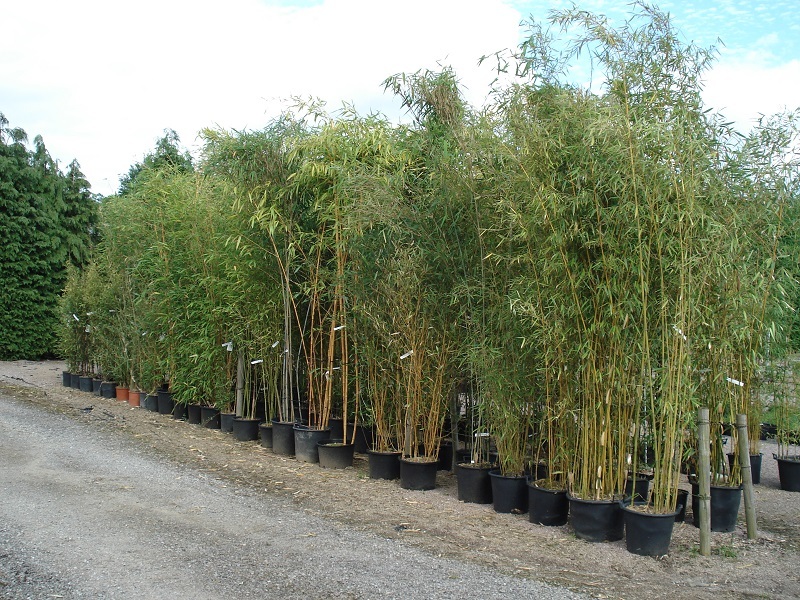 Although specialising in bamboos, we also stock a range of Shrubs, Grasses and Trees etc. We are pleased to receive visitors, but please remember that ours is a working nursery rather than a garden centre - we do not have fixed hours of opening, so it is essential to contact us before setting off in order to ensure that someone is available to deal with your enquiry. Payment by cash or cheques only please. We regret that it is not possible for us to carry out card transactions. 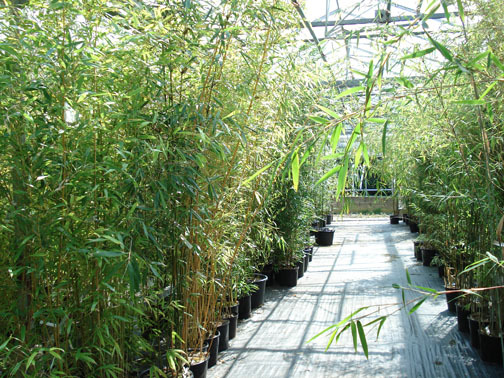 Many of our bamboos are grown in large sizes so that they quickly produce an impressive effect. Because of their size, however, they are not welcomed by delivery companies who much prefer small items in standard cartons which can be mechanically sorted. Our only means of sending mail order parcels is by Parcel Force but this is only suitable for a maximum pot size of 4L and currently we have no bamboos of this size. Whenever possible we encourage customers to collect their plants from the nursery. 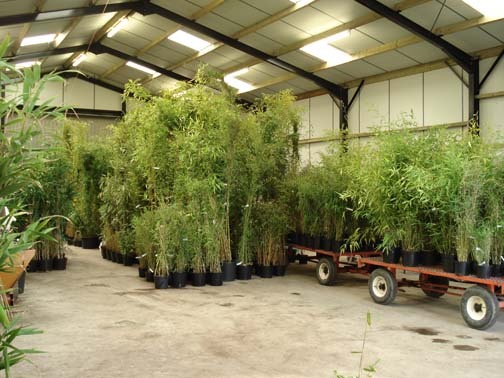 We will be pleased to assist with packaging, and as bamboos are both robust and flexible, they can be readily bundled and made quite compact, so that quite a number of them can easily be fitted into the average car. Where a number of plants are required, the use of a pallet delivered by a haulage company may well be a good alternative. In this case the weight of the plants is more or less unlimited, but because this method usually means that they travel upright rather than on their side, overall height, inclusive of pots and the pallet, is limited to the height of the lorry - about 2.2m, although the tops can sometimes be bent over. It may therefore be necessary for the tops to be trimmed. This causes little harm to the plant as its strength is in the root system. 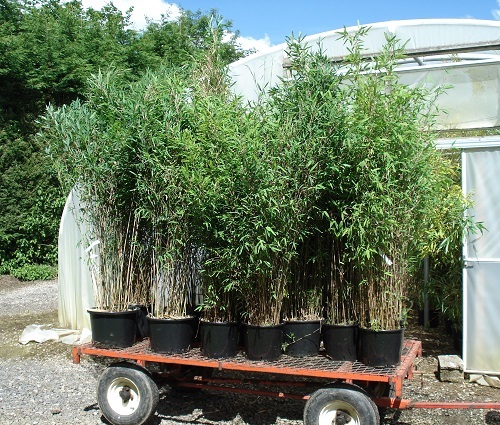 It may not be possible to despatch bamboos during hot weather or to send plants which have soft new growth. Please ask for further details if you think a palletised delivery may be of interest. 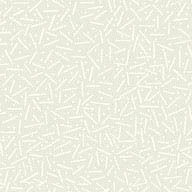 Costs are dependent upon location and the service required so please mention your postcode. Payment for this service can be made by BACS transfer if preferred. Unfortunately sending just 2 or 3 plants on a pallet is not feasible as the costs woud be disproportionate. Unfortunately it is not possible to despatch plants outside of the UK and Ireland.